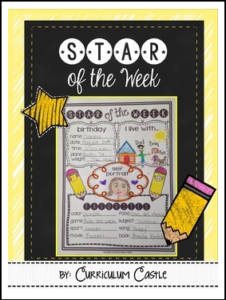 Our star of the week poster makes a perfect beginning of the year activity! Your students will feel extra special when you give them a chance to be featured as the classroom star! These posters look great displayed in the classroom. You can back them onto a piece of colorful construction paper, enlarge them at your local copy store, or just print and have students decorate them just as they are. This is a great activity to send home and have your students complete with the help of their family. * This poster is one activity found in our Teacher Binder & Back to School Survival Kit!